Formerly one of the mightiest settlements in English history, today Winchester is a charming market and cathedral city and the County Town of Hampshire. Located in England’s southeast and easily reachable from both London and Southampton, it’s well worth a visit, whether for its world-class shopping, impressive historical monuments or the gorgeous Old Town with its narrow streets and medieval buildings. 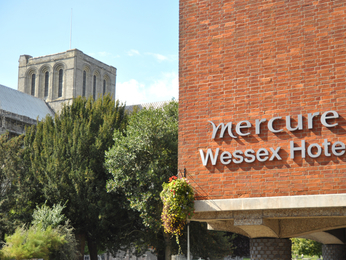 If you’re looking for hotels in Winchester, the Mercure Winchester Wessex Hotel is right in the heart of the old centre, just a few steps away from the city’s most famous landmark, Winchester Cathedral. As such, the Mercure hotel has one of the best locations in town, with lovely independent boutiques, local restaurants and the River Itchen all within easy walking distance. For 4-star hotels in Winchester, this is your ideal choice, offering a private car park, two restaurants and complimentary Wi-Fi. From the hotel, walk to all the town’s main attractions, such as the Winchester Great Hall and King Arthur’s Round Table, the remaining ruins of Winchester Castle, the Dean Garnier Garden with its stunning views of the Cathedral, and the 15th-century Butter Cross monument. At night, you can catch a theatre show, ballet or opera at one of Winchester’s premier entertainment venues in the cultural quarter, or enjoy a drink in one of its array of traditional English pubs. Winchester is a very lively city, with many community events, festivals and fairs held throughout the year.